• 1. Matthews Jr. Goes 4-for-4 The Hard Way. Like we've always said, if you're going to hit for the cycle, you might as well do it in order. Otherwise it just doesn't count. 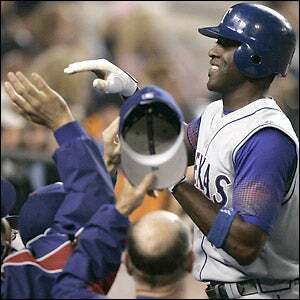 The Rangers' Gary Matthews Jr. led off Wednesday's game against the Tigers with a single, then had a double in the second, a triple in the fourth and a leadoff home run in the sixth to lead Texas to an 11-3 win. He also walked in the eighth, meaning that the only way Matthews didn't get on base was via an outfield error by Fernando Tatis. Meanwhile, poor Tigers; they've lost 10 of 15. • 2. Glee For Two. The last time the Mets had a magic number, Ronald Reagan was President, and Gorillas in the Mist was the greatest movie in all the land. Stupid 1988. New York won the division that year and is poised to do it again after its 7-4, 11-inning win over the Marlins on Wednesday put their magic number at 2. • 3. Jason Marquis Haunts The Earth You know, the more and more we watch Jason Marquis pitch, the more we realize that he's the result of one of those "What's grosser than gross?" jokes you used to tell in summer camp. He was hammered again early and often yesterday, and the Cardinals lost to the Astros, though their magic number is still, inexplicably, 13. Which is weird to think this bad of a team would have a magic number. • 4. Follow The Lieber. Carlos Ruiz and Jimmy Rollins hit two-run homers to support pitcher Jon Lieber, who won his fourth straight decision in Philadelphia's 7-2 decision over Atlanta. The Phillies are 1 games behind NL wild-card leader San Diego. • 5. Number Seven, Number Seven, Number Seven ... Hey, the Yankees also have a magic number, in case you've forgotten. Robinson Cano had five RBI as New Yok beat Tampa Bay 8-4, reducing their magic number to seven. Not really so magical, when you think about it, but heavenly!